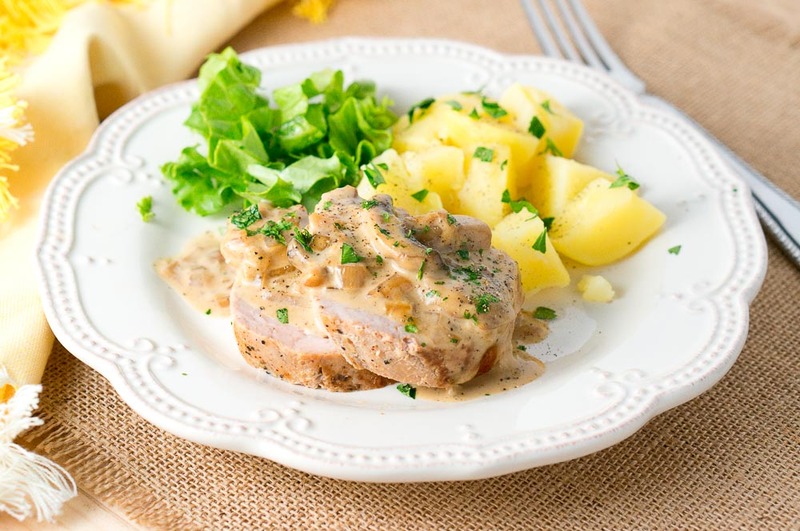 Pork Medallions with Creamy Mushroom Marsala Sauce. Easy, quick and delicious dinner that is also elegant and beautiful for a special occasion. The secret to juicier and tender pork is letting the pork rest for a few minutes before cutting. That’s because juices rise to the surface while cooking and when pork stands, it allows the juices to settle and return to the center. 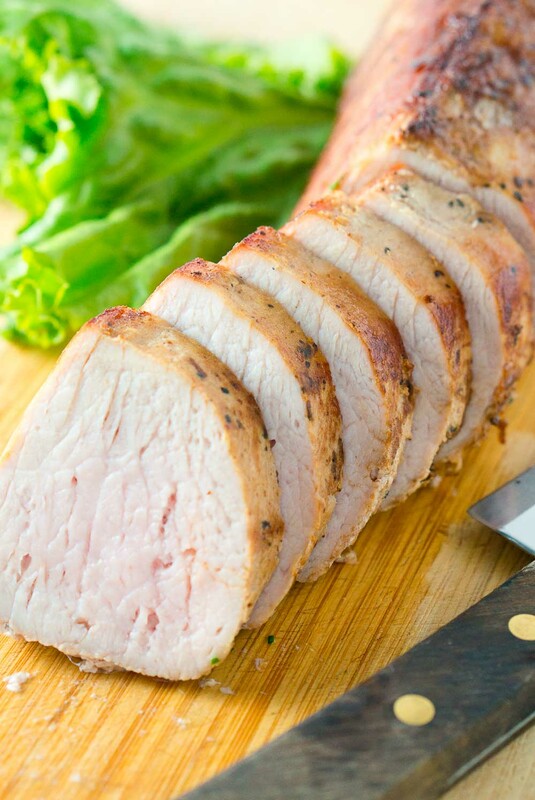 If you slice the pork tenderloin too early, it will allow the juices to run out, creating dry meat. Also, marinating the meat for several hours will help you get juicier pork loin filets. If you have been following me long enough, you probably already know that I love quick dinner recipes that are also delicious and big on flavor. 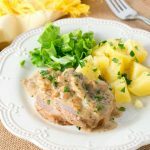 This recipe for Pork Medallions with Creamy Mushroom Marsala Sauce comes together in less than 30 minutes and tastes fantastic! 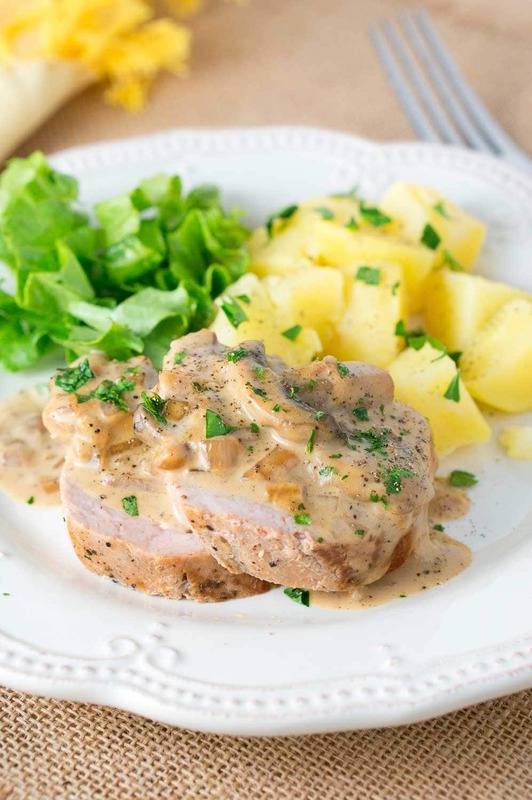 The pork loin is juicy and tender, and the mushroom marsala sauce compliments it wonderfully making for a delicious and gorgeous looking meal in no time. I am so happy that I found Smithfield Marinated Fresh Pork because it saves me a lot of time. You don’t have to marinate the meat for hours because it’s already marinated and all you have to do is cook it for about 20 minutes total. It doesn’t get easier than that. Real Flavor, Real Fast! You can find Smithfield Marinated Fresh Pork at Kroger. It was reasonably priced and you can feed a family of 6 with one pork loin filet. You can also easily double the recipe to feed a crowd or a bigger family. The quick prep method makes this a perfect option for an unexpected company or a hungry family. I love spending time with my family and cooking a delicious meal every night, but I don’t love spending hours in the kitchen. Instead, I prefer to keep things simple so I can enjoy time with my husband or family when visiting, which is why I love Smithfield Marinated Fresh Pork. The meal was fabulous and I spent only about 25 minutes in the kitchen. You can also add a side and a light salad to your meal. While the pork tenderloin was roasting, I boiled some potatoes. You can also serve these pork medallions with creamy mushroom marsala sauce with mashed potatoes, or mashed cauliflower. 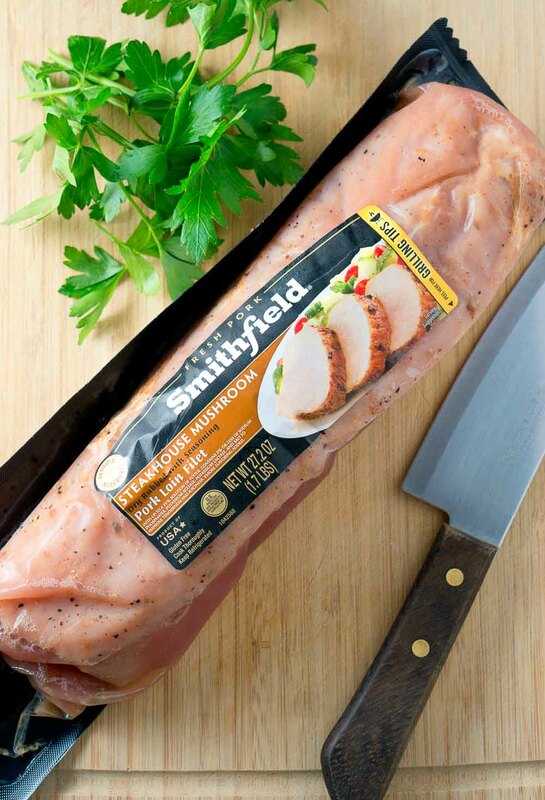 Smithfield offers a variety of meat cuts and products made from 100% fresh pork and it is packed with protein. Their pork tenderloin is available in a variety of flavors across Tenderloins, Loin Filets and Sirloins. I bought the Steakhouse Mushroom Marinated Pork Loin Filet and it was very flavorful, and it was perfect with the mushroom marsala sauce I made. Those flavors were amazing – true comfort food for the fall and for those busy weekends tailgating or for quick family dinners. Smithfield Marinated Fresh Pork is definitely on my go-to recipe list for an easy meal solution for any night of the week, not just occasions. Visit Smithfield for more recipe ideas. Preheat oven to 400 F with the rack in the middle. Melt 1 tbsp of butter in a large oven-safe (cast iron skillet or Dutch oven will work) skillet over medium-high heat. Once butter is melted, add pork loin and brown on all sides (about 6 minutes total). Place skillet in the oven and bake at 400 F for about 13 - 15 minutes, flipping the pork loin over halfway through baking. Bake until center of pork registers 160 F then transfer to a cutting board and let the meat rest for 5 - 10 minutes. 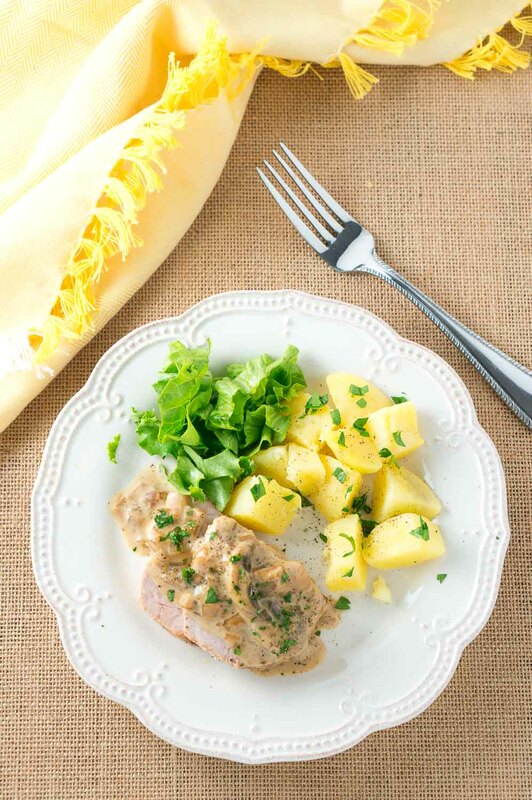 While pork loin is baking, melt remaining 1 tbsp of butter in a skillet over medium-high heat. Add chopped onion and minced garlic to the skillet, and cook for a couple of minutes until onion is translucent and soft. Add sliced mushrooms and stir. Season everything generously with salt and pepper. Let cook for about 5 minutes, stirring occasionally. When mushrooms are tender, add wine and heavy whipping cream. Stir and cook for about 8 minutes, stirring occasionally until sauce thickens. The sauce will thicken more when it cools off. Season the creamy mushroom marsala sauce with salt and pepper to taste. 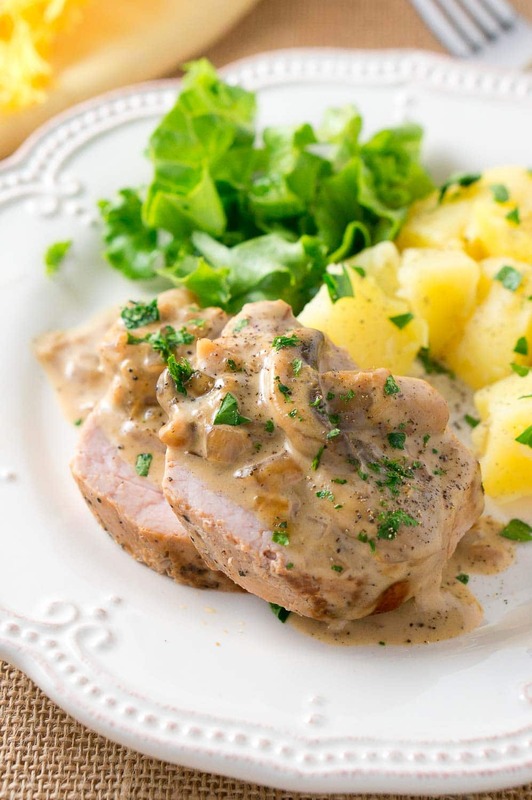 Slice pork loin in medallions and serve topped with the creamy mushroom marsala sauce. 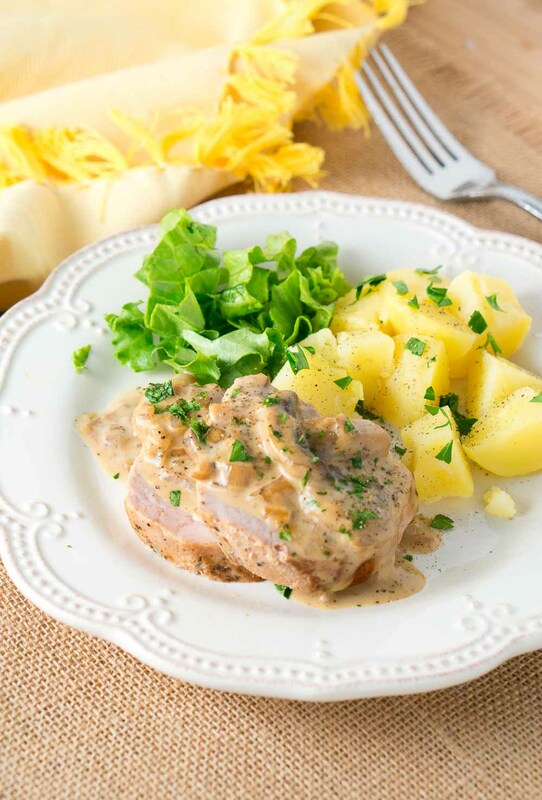 You can also serve the pork medallions with potatoes and a light salad. This is beautiful Neli– and good to know. I don’t eat pork, but my husband does, and I like to make it for him once in a while. I need to read how to cook it better since I don’t taste it when I am making it! Wow, the pork looks perfect. Tasty! I love quick dinners and this has all the flavors that I love! Marsala is one of my fave can’t wait to try it on pork! Thanks, Heather! I think you will love this! I’ve been on a mushroom kick lately, can’t wait to try this! Beautiful, tender looking pork in these very appetizing photos. Thanks for the post. I’m not a fan of mushroom at all, but I’m ready to try the mushroom sauce.